Virtual Insanity (Jamiroquai) music video screen shot, 1997. (http://www.vid81.com/). Qualifies as fair use under US Copyright laws because of photo's low resolution. On all sides of the political divide, we bear witness to some of the most unsophisticated thinking that anyone looking back on this time in history could ever possibly imagine. It’s not just that GOP/TPers like Michele Bachmann or Rick Perry don’t know basic American history or about a constitutional amendment that directly affected their lives as young adults. It’s not just the racial, socioeconomic and gender-based bigotry that Newt Gingrich and Herman Cain have given us for months. It’s among supposedly liberal and moderate political animals as well. It makes me question not only the political process. It makes me think that we should recheck the lead content of our water (tap and bottled), our vegetables and our meat. Gingrich’s statements over the past few weeks are much more than “unfortunate,” as Tony Kornheiser — an eighty-five-year-old impersonating a sixty-three-year-old — said on his ESPN DC radio show Tuesday. No, Gingrich’s statements are ahistorical, flat-out wrong, borderline racist, and downright nasty toward poor Americans and their children. 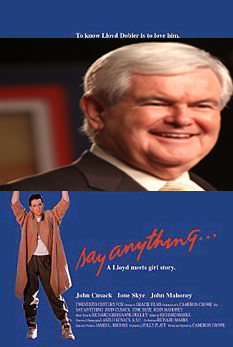 Say Anything... movie poster with cropped picture of Newt Gingrich at CPAC conference in Orlando, FL (taken September 23, 2011), December 7, 2011. (Quentin X and Gage Skidmore via Wikipedia/Donald Earl Collins). Released in public domain via cc by 3.0. To a crowd in Iowa last Thursday, Gingrich said, “Really poor children, in really poor neighborhoods have no habits of working and have nobody around them who works so they have no habit of showing up on Monday…They have no habit of staying all day, they have no habit of I do this and you give me cash, unless it is illegal.” Unfortunate is when you mistakenly drop your flash drive down a garbage disposal. This was so bigoted that it was actually dumb beyond words. And even I thought Gingrich had a bigger brain than this. This comes only a few weeks after telling the Occupy Wall Street protests to “get a job after you take a bath.” As if getting a college education only to become a $60,000 student loan debt-slave and find oneself unemployed is funny. No, Gingrich, you’re a slime ball, utterly out of touch with America and Americans. At least, any Americans who live in 2011 with less than $10 million to draw from. But the reactionary right isn’t the only group that has spoken foolery of late, showing us how corrupt our system of politics and government is in our age. Media types of all strips have spoken like simpletons as well. Take Charles M. Blow, visual Op-Ed columnist with the New York Times, who frequents on Twitter as a “pox on both your houses” type. Somehow, though, when people talk about not voting at all, his ability to be rational declines almost as far and as fast as Newt Gingrich’s. The question I have for Blow and voting purists is, what alternative universe do you think we’re living in? 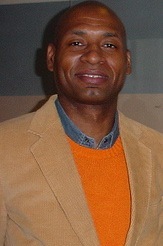 Charles M. Blow, visual Op-Ed columnist, New York Times (cropped), January 18, 2009. (Flickr.com via Arlene M. Roberts). In public domain. Where money isn’t the key to everything in American politics, and doesn’t determine everything from who runs to literally rigging the system on Election Day? And people considering the possibility of not voting are crazy? Really? Yes, I know how many people fought and died for my right as a Black male to vote in these United States of America. I’ve been teaching about it for half my life. But that America doesn’t exist anymore. This America, this one where Gingrich, Bachmann and Perry are viable candidates, where progressives with ideas for making our nation better are told they’re being “unrealistic,” is one where normal behaviors often aren’t rational ones. In this case, voting for two sides of virtually the same coin makes no sense to many. I, for one, will vote next year, and — barring Van Jones running or something — will vote for Obama. But unlike Gingrich or Blow, I’m not arrogant or traditional (or foolish) enough to believe that my ideas for how people should behave are the only ones worth considering.